Well my Holiday is well and truly over now but it’s back to work with a bang as I have some great British Quads up for auction this week and most of them are from the 1960’s and early 70’s! First up I have THE GALLERY MURDERS (1970) which was released under the title BIRD WITH CRYSTAL PLUMAGE from director Dario Argento, Other Crime / Thrillers from that era include STRANGLER’S WEB (1965) and THE MURDER MEN (1962) starring James Coburn and Dorothy Dandridge. 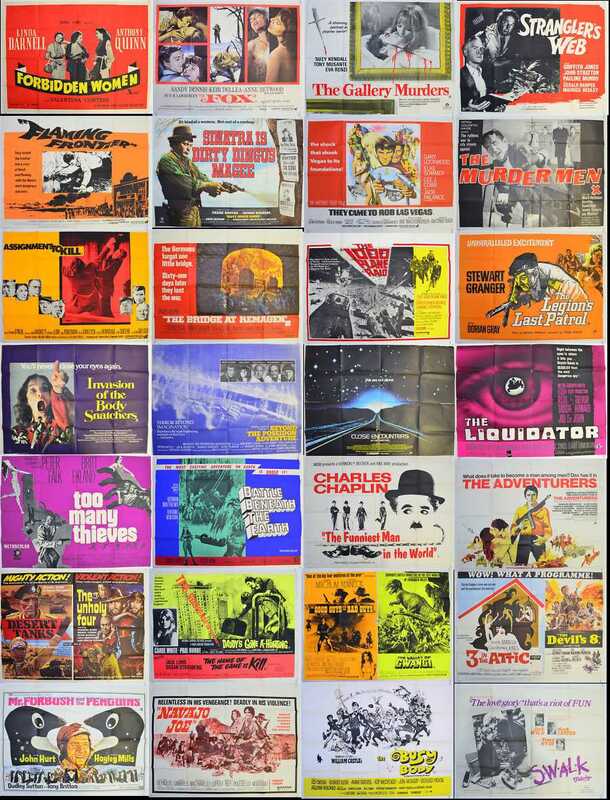 For Collectors of the Famous Poster Artist Tom Chantrell I have THE FOX (1967) starring Keir Dullea. From the War Film Genre I have THE LEGION’S LAST PATROL (1963) Stewart Granger, THE 1000 PLANE RAID (1969) and THE BRIDGE AT REMAGEN (1970) featuring George Segal, Robert Vaughn. And for Collectors of Westerns there is FLAMING FRONTIER (1965) Stewart Granger, Leticia Roman, THE GOOD GUYS & THE BAD GUYS / THE VALLEY OF GWANGI (1969) Double Bill, Plus Frank Sinatra’s Comedy Western DIRTY DINGUS MAGEE (1970). Plus many more great titles not to be missed! !